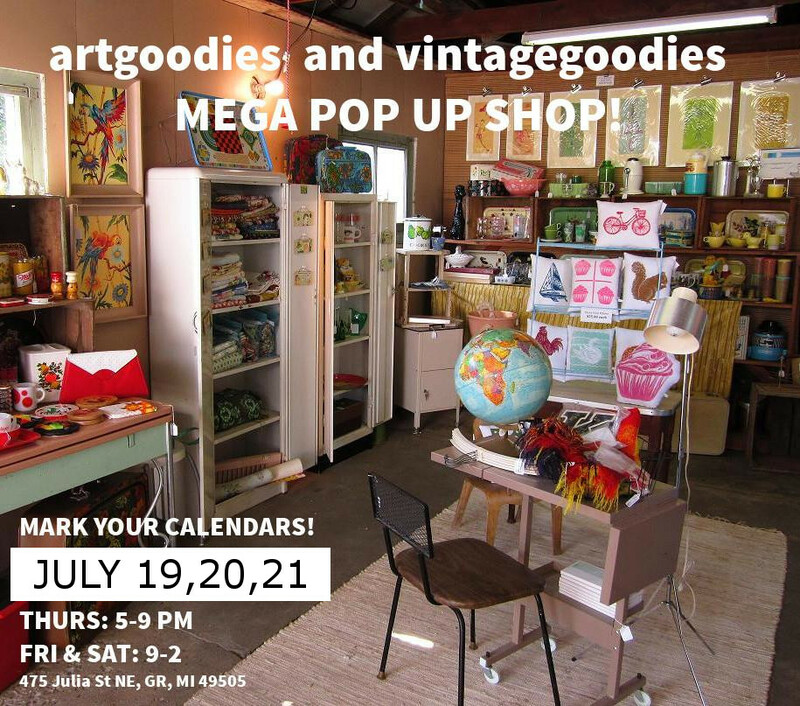 Once again I’ll be bringing my artgoodies and vintagegoodies shops to life in a Pop Up Style Boutique here in Grand Rapids, MI! Lots of great pieces, including vintage and studio clearance. 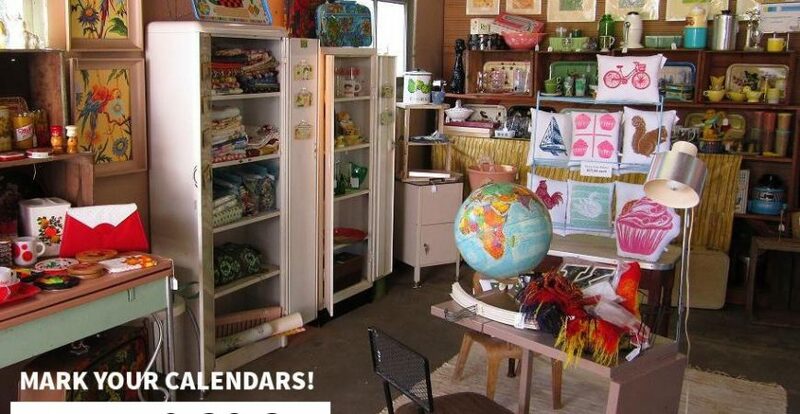 This pic is from a few years ago, but you get it, loads n loads of organized delightful goods! Vintage housewares galore, small furniture, artgoodies products, vintage textiles, and whatever else I find between now and then! A sale not to be missed! July! With the heat at the beginning of this month I guess the warm coral color for this month’s post is more than appropriate! I’m not a huge fan of super hot, however, these temps make for the perfect cottage days floating in the lake! 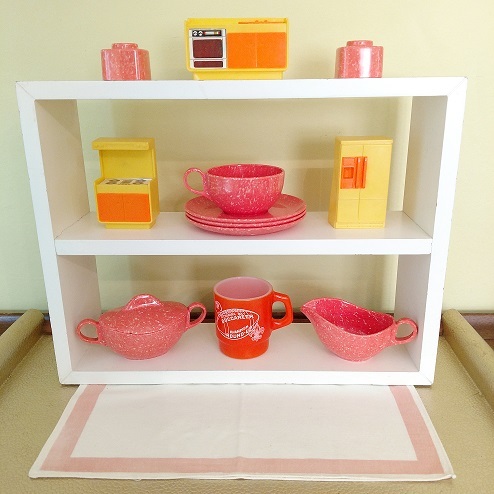 Fave vintage: fun plastic play kitchen, coral speckled melmac including hard to find salt n p’s! And a really unusual McDonald’s Tampa Bay Buccaneers Boy Scout milk glass mug by Anchor Hocking, haven’t found any info about that yet. Plus a peach stripe border napkin as an anchor. Fave vintage: speckled coral melmac, it’s the Gaiety line by Brookpark, designed by Joan Luntz. I tend to keep the aqua for myself but love the coral too. I had a gorgeous floral arrangement for the center that styles better, BUT I’ve never ever had a melmac bonbon tray so there it is! 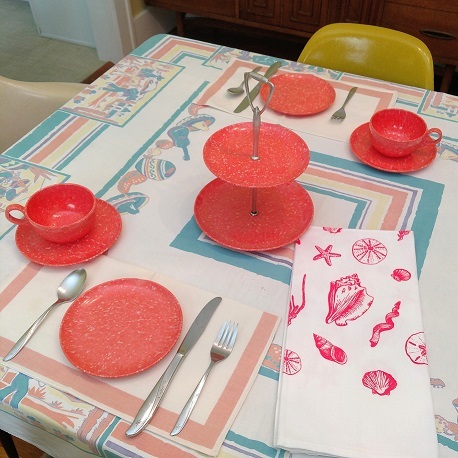 Back to vintage faves: peach border napkins, fiesta tablecloth, and a coral shell artgoodies towel (also available in navy) because it’s July and it’s lake/beach season!